The initial motivation behind this project, to understand the most popular dances of the "Jazz Age", was frustration and confusion. THE big dance of the time was the Fox Trot, but the Fox Trot as I understood it just didn't seem right. The Fox Trot classes I had taken felt complicated and contradictory with seemingly random assortments of "quicks" and "slows" and memorized routines, some of which required me to count (I've never been good at math). It felt like I was getting pieces of a puzzle, without understanding how they fit together. My Fox Trot wasn't much fun. How could such a dance have been so dominant and universally popular? How was it that this not very appealing dance (as I with my limited understanding understood it) was THE dance of the Jazz Age? The 1930s saw the introduction of the Rumba (also spelled "Rhumba") to the North American and European ballroom. It was the result of applying a European ballroom dance vocabulary to a Latin beat. 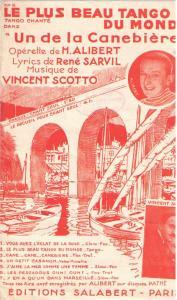 It began around 1930, and gradually grew in popularity through the '30s. By around 1935, it was a full fledged dance craze - though it never reached the heights of popularity enjoyed by the Foxtrot. When it first arrived on the scene, dancers applied familiar moves to a new beat. In the videos in this collection, there is a sophisticated group of dancers from 1930 using Tango/Foxtrot styling to a Rumba beat. While the classic Rumba box-step was being demonstrated by dance teachers as early as 1930, it took a few years for a distinctive style of Rumba to emerge among the general dance population that was significantly different from the Tangos and Foxtrots that came before, and part of its appeal was probably that it was a departure from the settled norms of the 1930s ballroom. First of all, unlike the "just walking" dances that had predominated since the Turn of the Century, it had that specific step. The second was the tendency of the partners to separate, and even when they were together they had an open frame and were seldom in the close embrace of the Foxtrot. Underarm turns were common and "throw outs" were a frequent feature, and the dancers even separated to do their own little personal Rumba before linking back up to their partners. 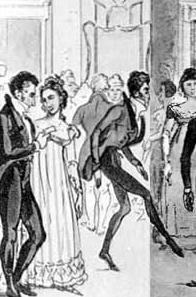 The Rumba also had an element of showmanship, of showing off, that had definitely not been part of mainstream social dancing. Certainly Swing dancers were all about putting on a show, but Swing, with its popularity among African Americans and the white kids who emulated them, was not seen in the clubs and ballrooms of adult white "polite society". The amazing Jean Gabin dances a smooth, elegant Java with a nice old lady from the film Belle Equipe. Containing Directions, for Dancing a Variety of New Quadrilles, as Introduced at the Assemblies of the Nobility and also at the Author's Balls & Assemblies. The Figures, described in French and English, clearly illustrated by Diagrams Shewing the various Situations & Evolutions of each Person in the Dance, with the appropriate Steps and the Time they occupy in the Performance. 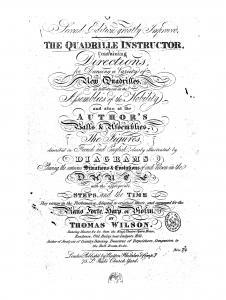 This compact book of instructions discusses the quadrille at the time it was being invented. In geometry, these early quadrilles were very much like later Victorian quadrilles (and American Square Dances for all that). However, the Victorians had largely given up on the steps that are such an integral part of the Regency Quadrille. The publication date is an estimate. The book is not dated, but the text refers to a long forgotten French opera about the Duke of Wellington, and it seems unlikely that the French would be writing operas about the Iron Duke before the Battle of Waterloo - and also mentions "Treasures of Terpsichore", which is dated 1816. I include this as a distinct heading, since Paris in the "Jazz Age", while absorbing the influences of the US and other countries, had its own distinctive style of dance. Given that Jazz Age Paris was the world capital of fashion, art and intellectual ferment, I think it appropriate that a survey of Jazz Age dance should take a moment to look at how people were dancing in the world of Chanel, Hemingway, Piaf and Picasso. The style of dancing seems to have persisted with very little change until the inexorable march of Rock and Roll eclipsed it in the '60s. While lumping it all under the title of "Bal Musette" may not be precisely correct, since there was plenty of dancing taking place in France in places other than Bals Musettes (upscale nightclubs, private parties etc. for example), it is a convenient shorthand for this distinctive French style. A "Bal Musette" was an informal sort of dance, hosted in bars, restaurants and dance halls, open all to social classes and often with a decidedly down market feel. It was danced on a small dance floor with a modest band (trio, quartet, quintet) that nearly always featured a "musette" accordion. The Elizabethan, like ourselves, generally ate three meals a day. The first was breakfast, which was eaten shortly after rising, but not before attending morning services (farmers wouldn't have time in the morning to attend services any day but Sunday, but pious townsmen, the gentry and their servants often did go to the chapel daily). Breakfast was a small, simple meal, generally consisting of cold foods, as the cook fires were just being lit as the breakfasters were rising. Leftovers, eggs, butter, bread and small beer were commonly taken with breakfast. But, since breakfast was by definition eaten early, those who did not rise early did not eat it. Unless they were traveling or fond of the hunt, nobles generally did not rise early enough to eat breakfast, and dispensed with it in favor of a hearty mid-day meal. Working men and women however, who rose with the sun, seldom failed to fortify themselves against the day.